Remember the Psychic Justice Tour? What about ParaCon 2010? Despite the tour being over, we must remember that it didn't end as Robbie Thomas had predicted. We know this because his poster suggested that he was doing a lengthy tour and it ended after about half a dozen shows (all with horrible numbers of attendees). Robbie Thomas was the organizer of CanAm ParaCon 2010 - held early August at the local Quality Inn. Since the event we have been able to confirm a number of details. Robbie Thomas is no longer advertising his Queen Mary "tour". Interestingly, when contacted, the staff at the Queen Mary were unaware of who Robbie Thomas was and were not aware of any scheduled tours with him. Robbie Thomas' "best selling" book has not sold any copies on Amazon which probably means that all customer reviews on other book selling sites are probably fake. Many of the contributors to this blog have been banned from commenting on Robbie Thomas' videos on YouTube. If you have a YouTube account, consider adding a comment to Robbie's videos and make reference to this site. Sometimes I think you are an angel...I'm sorry I didnt get your reply in time , but,....It all worked out okay . I have wonderful news,... Coreys' mom just called and he is fine ! He was ticked off, just like you said.....he said he didn't think anyone would even notice he was gone. Thank-you for all you have done Robbie..........we so very much appreciate it. Psychic who claimed 8-year-old Victoria Stafford would be found well and safe on April 13 2009 on The 'X' Zone. On Sunday July 19 2009, her lifeless body was found near Mount Forest, Ontario. Reports suggest that Victoria Stafford was murdered within a day (or two) of the abduction (April 8, 2009). Not only was Robbie Thomas wrong about Victoria Stafford being found well and safe - at the time he made such a claim, she had already been murdered. Robbie Thomas is not psychic. Robbie Thomas(claimed psychic)'s latest website (he has changed his website almost as often as he's changed his stories) has an all-new (but really tired) "About Robbie Thomas". See it for yourself at http://www.robbiethomas.net/ if you'd like - or read it with a proper interpretation right here. ABOUT ROBBIE THOMAS Robbie Thomas is a Best Selling Author with the book Paranormal Encounters. He has also three other books, published titles are...Signs From Heaven, To You From Spirit and A Link To Heaven...Chats With The Other Side. His success has seen two screenplays being written with a third in development for a trilogy titled, 'Paradox' in the Paranormal Horror genre. First of all, Robbie Thomas (if at all) is only a best selling author compared to other books at his little known publisher. No major magazines or newspapers have identified either of his books as best sellers ever. Robbie references his "success" as having (in the past) seen two screen plays being (currently) written. This is probably completely made-up but we'll give him the benefit of the doubt. The "third in development for a trilogy titled 'Paradox'" is interesting when you consider that 'Paradox' (as per the auto-reply email that I got from his email address in February) was supposedly "... coming to screens everywhere in 2009. Robbie produced, directed and wrote the screenplay for this factual based movie based on the Paranormal and twisted it with Horror." (See the bottom of a previous blog entry by Sarnia Skeptic.) Or check out Robbie's YouTube video advertising it. Robbie is a contributing Author to three other titles one of which he worked with Award Winning Screenwriter, Gloria Shepherd. With Paranormal Encounters being a Best Seller there is more to come from Robbie, keep your eyes open for the new smash hit book 'Paradox The Gates Of Hell' coming soon! Neither The Sallie House nor the Dead Whisper were hit movies if you follow any definition of "hit movie" that I could find. Robbie is hardly an outstanding professional motivational speaker - http://www.ghostlytalk.com/audio/Can-AmParacon2009/01-robbiethomas.mp3 - this was a talk from the 2009 ParaCon event. The CanAmParafest.com site is (at the time of writing) not active. Robbie has changed the name of the event each year with the website for each year disappearing shortly after the event was supposed to have happened. At this point we have not heard from a single person who attended the 2010 event (if it even happened) but we do know that 2009 was a flop (I went). He has successfully assisted in murder/missing persons cases for twenty years with different Law Enforcement Agencies and families internationally as a Psychic Criminal Profiler. In 20 years (Robbie claims, now, that he has been doing this for 20 year) he has never solved a case - I wouldn't consider that to be "successful" assistance. Countless missing person's groups sternly state that they do not work with psychics and many have posted formal warnings about the harm that psychics do/have done/can do. The Cano case (also listed on the "Cases" page) was not solved by Robbie Thomas. Robbie has been featured in many magazines world wide, notables would be, Paranormal Magazine (England), Fix Magazine (Canada), Unexplained Paranormal Magazine (United States), Haunted Times Magazine (UnitedStates), Silent Voices (England), Visions Magazine (United States) and many more. Forgive me, Jessica (the publisher of Fix Magazine), but Fix Magazine is not a "notable" "world wide" magazine - it is a good local arts and entertainment magazine (http://www.fixmagazine.ca/). I have a hunch that, though he may have been featured in it in the past, a second feature won't be happening. The issue of Robbie being featured in magazines does not change anything. If your life and career are based on blatant lies and fraudulent claims, it doesn't matter how many magazines or newspapers you are in - the lies are no more true and the false claims are no less false - you are a liar and a fraud. Until Robbie Thomas presents a single bit of supporting evidence to back up his claims, we will have to assume that the claims are false. And that's all you need to know about the non-psychic Robbie Thomas. For humour, check out this contract that Robbie Poulton/Robbie Thomas created for another project he was supposed to do: http://www.prrsociety.org/contract.html. The Robbie Thomas Paradox: Does he ever speak the truth? Our good friend Robbie Thomas has re-joined Twitter. A while back Robbie was using his twitter account to publicize his involvement in cases that he has not solved (oddly, he failed to mention that). Some of the cases go back years and years - even ones that he claimed would be solved within months. Robbie Thomas cleared his Twitter account because at least one family began notifying him that he is not permitted to use their deceased family member for his self-promotion. He denied he was (Robbie lies) but deleted the twitter account anyway (failing to realize that I and SarniaSkeptic had already made copies of it all). Well, Robbie Thomas (www.twitter.com/Robbie_Thomas) is back at twitter (I think he missed having us point out how stupid he is). A recent post (the most recent at the time of this entry) talks about his "4th release" (4th book) that supposedly hit #2 on the best sellers list at PublishAmerica on June 25th. A week later (and to this day) the book is not listed anywhere in their best sellers list. I find this most fascinating because on http://www.deadwhisper.com/people.htm you see that he had written 8 books by 2006. Since then the number has dwindled to a mere 4. I was intrigued by the title, but after reading into the book two chapters I knew that this book would be a disapointment. It is poorly written, gives no new information, and is possibly the worst book on the paranormal I have ever read. Feeling ripped off, I wanted to return the book, but found that I should contact the author and express my thoughts. In google I found Robbie Thomas, the author accused of many unlawful and unethical things. One web site in particular had information on him. stoprobbie.com is all you need to know. The stories about this movie being made were totally made up according to the people involved. The movie was said to be shot in 2008 and 2009, yet has never been released. There are Youtube videos of the movie and that says it all. It is horrible and the book is the same way. This book is horrible. I could not recommend it and I wouldn't suggest sending your hard earned money to a con man. And one of them created a "fan" video on YouTube. Since work has me on the road quite often these days, there has been little time to blog. Just like my last posts, this one is going to be quick with a real "mash up" of topics. Most emails we're receiving are positive and supportive which is somewhat surprising given that Robbie Thomas supporters seem endless on his Facebook page. I realize that there is a bit of back-patting going on with many of his supporters because they, too, are woo-woo pushers or members of the "I'm a psychic too" group. A blog reader sent us links to pictures from Robbie's show in Indiana where you will see the packed house that it was (not). Reports from attendees agree that, in all, there were 14 people in attendance. Our good friend SarniaSkeptic (http://sarniaskeptic.blogspot.com/) received a reference too. To be fair, the article was spurred by his recent covering of a local group's attempt to 'fundraise' by having a psychic come to Sarnia to ruin people's true memories of their lost loved ones. Ryan Hulshof, a local skeptic and fervent supporter of this site (and the skeptical community as a whole), was kind enough to speak with a reporter about the supposed rising tide against claimed psychics. Unfortunately the article wasn't all that well researched as SarniaSkeptic's recent tongue in cheek "I was wrong, I am sorry" article was taken completely (intentionally maybe) out of context. Congratulations and thank you Ryan and the rest of the skeptics in Sarnia - you are a real inspiration and a great help! In other news, a local company has come forward to cover the domain costs for the site so the http://www.stoprobbie.com/, http://www.stoprobbiethomas.com/, http://www.stoprobbiethomas.net/ and http://www.robbiethomastours.com/ will be ours for the next 10 years! And finally, for those who have emailed to offer assistance or to become a part of our "group", Thank You! I will get back to each of you personally when time allows. Our great friend, Robbie Thomas (who is not psychic) needs some help with publicity so we're going to give it to him. If you care to believe John Ramses (Robbie Thomas' ex-manager), Robbie Thomas is likely to be visiting his girlfriend (to his wife's dismay) in Sioux City, Iowa this week. It is advertised on Robbie's site that he will be doing a reading for the Jodi Huisentruit case. The show is on May 21, 2010. I'm not suggesting that everyone should contact the Volunteer Fire Department to let them know that, to stand with the police and victimized families who DO NOT SUPPORT Robbie Thomas, the Fire Department might want to reconsider letting a known lying scumbag use their facilities. Someone should contact them, though. To those that are planning on attending Robbie's shows with the goal of disrupting the performance, we ask that you do not. Please take the "high road" - Robbie Thomas is the lowlife slimeball and we don't want to stoop to his level. Recordings of Robbie's shows and readings are much more valuable than disrupting a performance (hey, they have all had less than 30 people!). If you have recordings of Robbie (his readings, his shows, etc.) we would be interested in getting a copy of it or reviewing it. Please contact us at emailus@stoprobbie.com if you have anything that might help us in our quest to Stop Robbie Thomas. With the recent news coverage that Robbie received, a number of people had emailed the emailus@stoprobbie.com account. Thank you! One of the other contributors asked if I'd be able to comment on it. As some are aware, I have little to say about Robbie but I'll try my best to cover the recent news. The comments on the news article appear to be the "what's the harm? ", "Robbie is a fraud" and the others are likely Robbie masquerading as someone else claiming that the "haters" are losers. Typical Robbie fare - typically stupid stuff from a rather inane character. I think it is important to address (again and again) the "what's the harm?" question and I'll do that before I get into the "Robbie proves that he's not psychic" part. I really sympathize with anyone who has lost a loved one at the hands of another person - I can only imagine the horror that a family endures to know that their family member was kidnapped or murdered and that the crime remains unsolved. I believe, too, that I'd accept whatever 'help' was offered in a time of need. Many would see it as a "nothing ventured, nothing gained" type scenario or take an "if a psychic can solve it, great, if not, we're no further behind" position. That, however, isn't all that happens. Psychics (which almost certainly do not exist so when I mention "psychic" in reference to a person, I mean "claimed psychic" or "pseudo-psychic") waste valuable police resources, provide false hope to a family and distort and desecrate the memories that families have of their loved ones. Not only that, but (as in Robbie's case in particular) psychics have falsely accused others of horrendous crimes that they never committed. I suggest to anyone who welcomes a psychic to solve their crime that the false accusation against someone else is harmful. I've been through this before - I encourage you to take a look at some of the links on the link pages on this site. Now, on to the great stuff - anyone who accepts this recent news as a positive for Robbie Thomas can only do so if they choose to forget all of his previous news. ALL of the press that Robbie gets as it relates to his assisting in the resolution of unsolved cases is in advance of the case being solved - there has never been an instance where the paper/tv has published an article on him (especially not days later!) to announce his success. That has never happened - and it will never happen as a result of any claimed psychic abilities. Five or so years ago, Robbie Poulton of 'Robbie Thomas Offices' (as referenced here) (we've been asked to clarify the Robbie Thomas we're speaking about because others have emailed us concerned that they are being falsely accused of scumbaggery), met with a local (to Sarnia) family to "assist" them in the resolution of an unsolved crime (murder) that was committed against their sister. The newspaper covered it, and Robbie proudly touted that coverage as "proof of his abilities" (if it is "proof" of anything, it is "proof" that he claims something and not that he has achieved anything) - today, more than 5 years later, that case remains unsolved. Robbie told the family that the crime would be solved in 6 months. Robbie met with the family (family members have told me that he went to the house and left his business card on the door step!) of another person who, at the time, was missing - in this case the young girl was kidnapped (footage showed her being escorted away from school by an unidentified person). During that meeting, he told a family member that the girl was still alive and would be returned home. He bragged about his involvement in the case, went on a radio show to talk about it and to tell the radio host what he told the family (that she was still alive). Today, he has the nerve to suggest that he helped in resolving the case - the girl, who was murdered a week (or more) before Robbie claimed she was still alive, obviously did not return home alive - she wasn't even alive when he was telling the family that she was. The Ontario Provincial Police (the agency that ultimately solved the case) has firmly stated that they do not use psychics and that Robbie Thomas was not involved in solving the case. Where's the headline Robbie? You read this whole article? Great! Watch Good Morning America on Saturday, May 8. I predict it might be worth doing so! Sources tell us that Robbie's Fort Wayne, Indiana show had 14 people in attendance. I became involved with Robbie Thomas about a year ago when I had written a blog about the Tori Stafford case. 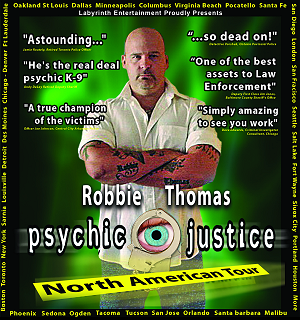 When the police had informed the public that arrests were made, I wrote a blog entry stating the obvious - that a psychic (namely Robbie Thomas) would be standing with the police at the press conference to be recognized for solving the crime. Sadly, Robbie must have been too busy solving other crimes that he couldn't make the press conference. What made me mad, however, was that the police didn't even mention him. Not in passing and not even a reference to a psychic being involved. Obviously the police are covering something up. Carrie recently posted a blog on "keen" that might interest some of the followers of this "movement". "Dear Robbie, Sometimes I think you are an angel...I'm sorry I didnt get your reply in time , but,....It all worked out okay . I have wonderful news,... Coreys' mom just called and he is fine ! He was ticked off, just like you said.....he said he didn't think anyone would even notice he was gone. Thank-you for all you have done Robbie..........we so very much appreciate it. " "Psychic who claimed 8-year-old Victoria Stafford would be found well and safe on April 13 2009 on The 'X' Zone. On Sunday July 19 2009, her lifeless body was found near Mount Forest, Ontario." (By the time that Robbie claimed this on the referenced radio show, Victoria (Tori) Stafford would already have been murdered. Just as Mark Edward mentioned in his posting on SkepticBlog.org, it is common for names to be misspelled - often intentionally. It's McConnell not McConnel, Robbie. Sarnia Skeptic mentioned some of his goals for the site and I really appreciate the work that him (it is a him, isn't it Susan?) and others are putting in. Yesterday we created a couple of links pages (on the right hand side below the banner) that have links about Robbie Thomas and another page that has links about psychics and their involvement in criminal cases. I encourage you to take a look at the links about Robbie Thomas. We know that it is not a comprehensive list so we ask that you send us any other Robbie Thomas related links that you have to emailus@stoprobbie.com. Some of the links are pretty funny. His story in Visions Magazine, his resume and his requested contract are worth a look. I have invited a couple of guest contributors and we would entertain the idea of adding others. If you would like to contribute, please send an email to emailus@stoprobbie.com. If you are in the area of either of these events and are available the night of the show, I would encourage you to contact sarniaskeptic@gmail.com or me at emailus@stoprobbie.com. No, we have not "formally" organized a group. We share a common goal but we have not identified a person who will be our media contact. As it stands right now the two contributors to the blog (Sarnia Skeptic and I) are not interested in being in the spotlight. If you have a specific media request, there are a number of supporters that we could direct you to that will/could answer questions. This site isn't about me or any of the other contributors. It is about stopping Robbie Thomas (who is not psychic) from continuing to abuse people. At this point we are not looking for donations. Contributions of links for the site, articles for the site and digital content (handout and flyers) for the site are what we're looking for. This site is not affiliated or endorsed by Robbie Thomas (who is not psychic). It is for information only and does not necessarily represent the opinions or views of our employers, sponsors, supporters or, even, contributors. The subject of this entry really has two meanings. Many people have put in their valuable time in an attempt to expose Robbie Thomas (claimed psychic) with almost the only goal being to get Robbie Thomas to stop abusing people. This site will be less of a blog and more of a referral source for the information on Robbie Thomas - it may change over time but the single focus will be on Robbie Thomas' horrible and despicable activities. If you have anything to add (keep in mind that we're just beginning), please email emailus@stoprobbie.com.